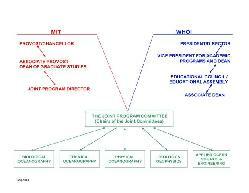 For more detailed information regarding organization of the The Joint Program Committee, please refer to the chart on the right. In addition to the Co-Chairs, the membership consists of the WHOI Associate Dean, and the Chairs of the Curriculum Joint Committees - the Joint Committee for Applied Ocean Science and Engineering (JCAOSE), the Joint Committee for Biological Oceanography (JCBO), the Joint Committee for Chemical Oceanography (JCCO), the Joint Committee for Marine Geology and Geophysics (JCMG&G), and the Joint Committee for Physical Oceanography (JCPO). The Co-Chairs of The Joint Program Committee appoint the Chairs of the curriculum committees from among the membership of their respective disciplinary committees. Normally, two of the curriculum committee chairs are from one partner institution and three chairs are from the other partner institution. The WHOI Registrar, Graduate Admissions and Student Affairs Officer, Budget Manager, and the Administrator of the MIT-WHOI Joint Program at MIT are ex-officio members of The Joint Program Committee and attend meetings in the capacity of senior staff of the Joint Program. One of these individuals will act as recording secretary for each meeting.